This report aired on Sept. 12, 2013 on Prairie Public. It’s part four of a four-part series on injuries and deaths in North Dakota’s oil patch. Todd Melby was the reporter. 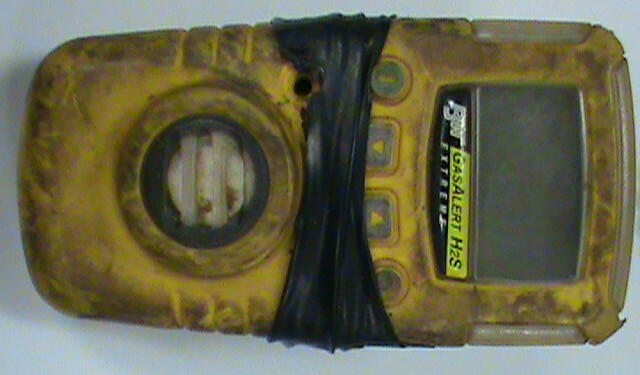 Photo of Dustin Bergsing’s H2S monitor courtesy of OSHA. Made possible by a grant from the Fund for Investigative Journalism. As oil field jobs go, Dustin Bergsing seemed to have a pretty safe one. He wasn’t swinging pipes on a drilling rig or working near big, moving trucks. He was a well watcher, monitoring tank levels near Mandaree. Bergsing worked alone, often at nights, for a Marathon Oil contractor. Once every two hours, he climbed a ladder, walked across a metal catwalk, opened hatches and peeked inside a series of giant brown storage tanks that were filled with a mix of crude oil, gasses and frac water. If one of the tanks was nearing capacity, he changed the flow so another tank would start filling. One of the few dangers Bergsing faced was possible exposure to hydrogen sulfide gas, also known as H2S gas. It’s an odorless, colorless gas that some wells naturally produce. It can kill a person. So Bergsing wore a yellow H2S monitor on his helmet to warn him of high levels of the deadly gas. Still, something went wrong on the night of January 7, 2012. Just after midnight, Bergsing failed to respond to an alarm indicating a tank was almost full. So a co-worker came to check on him. The co-worker found Bergsing’s lifeless body on a catwalk. “His death was reported to us as a fatality,” says Eric Brooks, the local director of OSHA — the Occupational Safety and Health Administration. “All right. I’ve got the case file here.” Brooks sent an investigator to determine how Bergsing died. The most likely cause of death seemed to be H2S poisoning. But it turns out Bergsing’s monitor was working and that wasn’t what killed the 21-year-old oil worker. “The medical examiner’s identified professional opinion was that the hydrocarbons found in the victim’s blood did not appear to be work-related,” Brooks says. After Dustin Bergsing died, his mother, Trista Juhnke, hired an attorney. “Hi, my name is Fred Bremseth and I’m a personal injury trial lawyer,” says Fred Bremseth. But Bremseth believes those hydrocarbon vapors were definitely work-related. You see, hydrocarbons come from natural gas, a byproduct of crude oil. If that gas isn’t captured or flared properly, it can fill the air and suffocate a person. That’s what he learned when a surprise witness who came forward after Bremeth sued against the Houston-based company. “He had been fired from Marathon Oil. And of course, we asked him why,” Bremseth says. The man, whom we’ll call Mr. X, has a chemistry degree and works as an environmental engineer. He didn’t want us to use his real name for fear of losing his current job. Mr. X was hired by Marathon Oil in October 2011 — about three months before Bergsing died. Soon, Mr. X noticed that large amounts of hydrocarbon vapors were leaking from oil storage tanks. In the past, Marathon routinely used two flare stacks per tank. Now, according to Mr. X, the company was just using one. As a result, that natural gas flowed into storage tanks like the ones where Bergsing worked. “In fact they had gone and measured some of the gas levels,” Bremseth says. “And to his belief, those levels were not only toxic, but lethal.” So Mr. X began writing emails to supervisors. Here’s what he told Fred Bremseth in his sworn statement. Says Fred Bremseth, “If you become overcome by the gasses, it’s too late.” Mr. X believes those circumstances were deadly for Dustin Bergsing. “Yep, that’s what got him,” Mr. X told Bremseth. In June 2012, less than one year after he started working at Marathon Oil, Mr. X was fired. Marathon Oil executives refused to be interviewed about the case or Mr. X’s testimony. Instead, the company issued a statement. Marathon Oil says Mr. X was fired for “performance reasons” and that his statement to attorney Fred Bremseth was “grossly inaccurate and wholly without merit.” The company says Mr. X’s statement happened without its corporate lawyers in the room and therefore, it’s one-sided. I asked Bremseth about this last point. Four months after Bergsing died and a second person became dizzy while working near oil storage tanks, Mr. X says Marathon finally took action when it began supplying its contractors and employees with air respirators. “Nobody should be going out to those well sites without self-contained breathing apparatus or supplied air respirators or not being there alone,” Bremseth says. The company eventually reached an out-of-court settlement with Dustin Bergsing’s family for an undisclosed sum of money.